© Marie LoParco, "Angel With Blue Wings", mixed media painting, 12" x 24", All Rights Reserved 2017. Sold. ©Marie LoParco, mixed media, “Garden Angel, ” 11“ x 14"on canvas, All Rights Reserved 2017. Sold. ©Marie LoParco, mixed media painting, “ Angel On Horseback ”, 8" x 10", All Rights Reserved 2017. Sold. © Marie LoParco, "Angel On the Back of a Flying Bird", mixed media painting, 8" x 10", All Rights Reserved 2017. Sold. 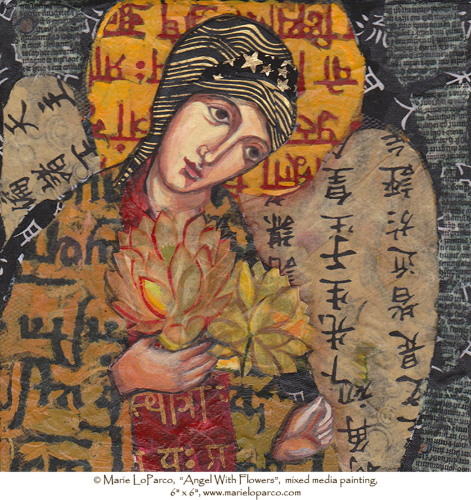 © Marie LoParco, "Angel With Flowers", mixed media painting, 6" x 6", All Rights Reserved 2017. Sold. 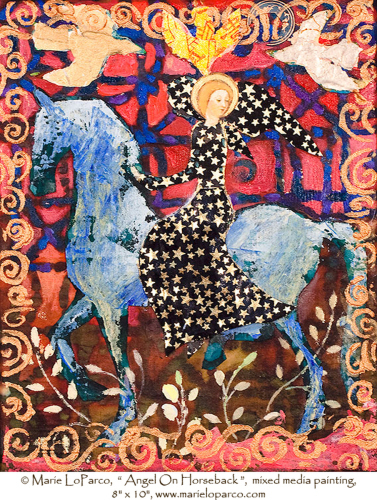 © Marie LoParco, "Angel With Running Horse", mixed media painting, 12" x 24", All Rights Reserved 2017. Sold. 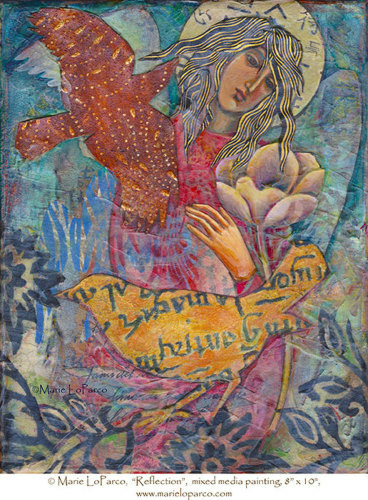 © Marie LoParco,” Angel With the Golden Bird”, mixed media painting on canvas, 24" x 48", All Rights Reserved 2017. Sold. 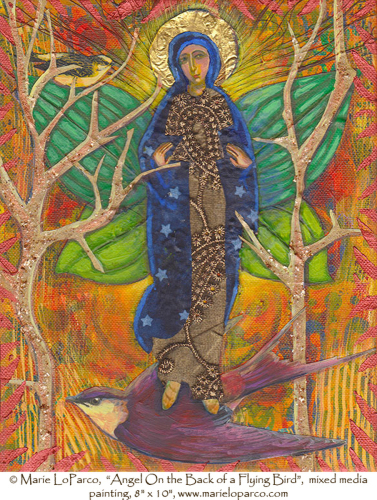 © Marie LoParco, "Earth Guardian", mixed media painting, 12" x 24", All Rights Reserved 2017. Sold. © Marie LoParco,"Guardian Angel With Globe", mixed media painting, 12" x 36", All Rights Reserved 2017. Sold. © Marie LoParco, "Floating Guardian Angel", mixed media painting, 12" x 36", All Rights Reserved 2017. Sold. © Marie LoParco, "Angel Flying With Four Birds", mixed media painting, 12" x 36", All Rights Reserved 2017. Sold. 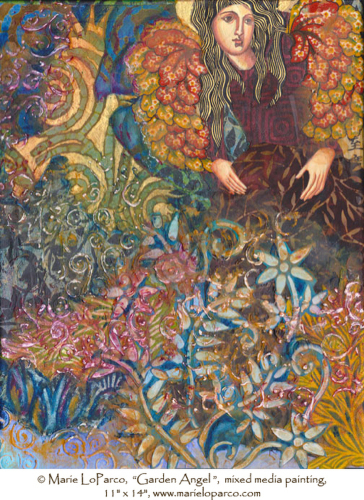 © Marie LoParco, "Inner Vision: Angel Gazing at a Star", mixed media painting on canvas, 12" x 36", All Rights Reserved 2013. Original sold, 5" x 16" archival prints available for purchase. 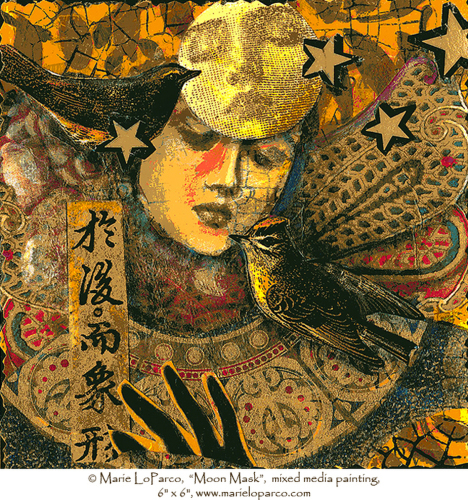 ©Marie LoParco "Angel With Moon Mask" 6"x 6", All Rights Reserved 2016. 0riginal sold, archival prints available for purchase. ©Marie LoParco, "Reflection," mixed media painting. 8" x 10" original sold. 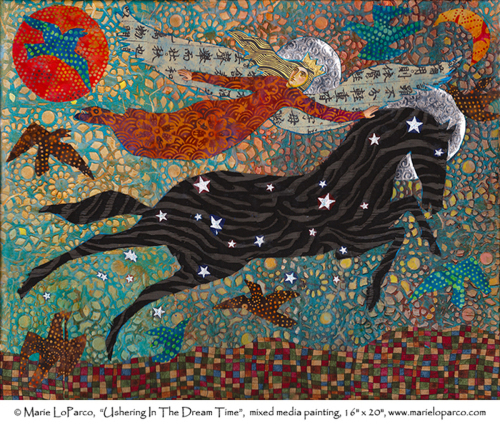 ©Marie LoParco, “Ushering In Dream Time” is a 16" x 20" original mixed media painting. " Original painting is sold, however, 8" x 10" archival prints are available for purchase. 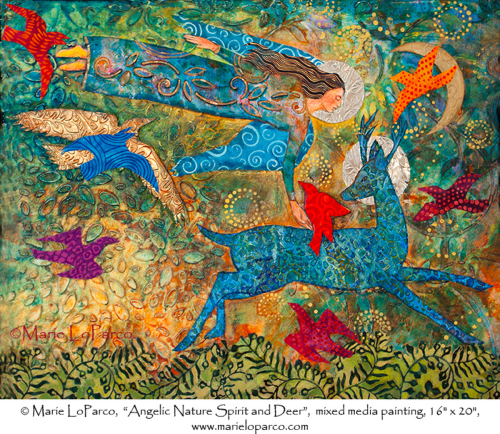 ©Marie LoParco, “ Angelic Nature Spirit With Deer” is a 16" x 20" original mixed media painting.